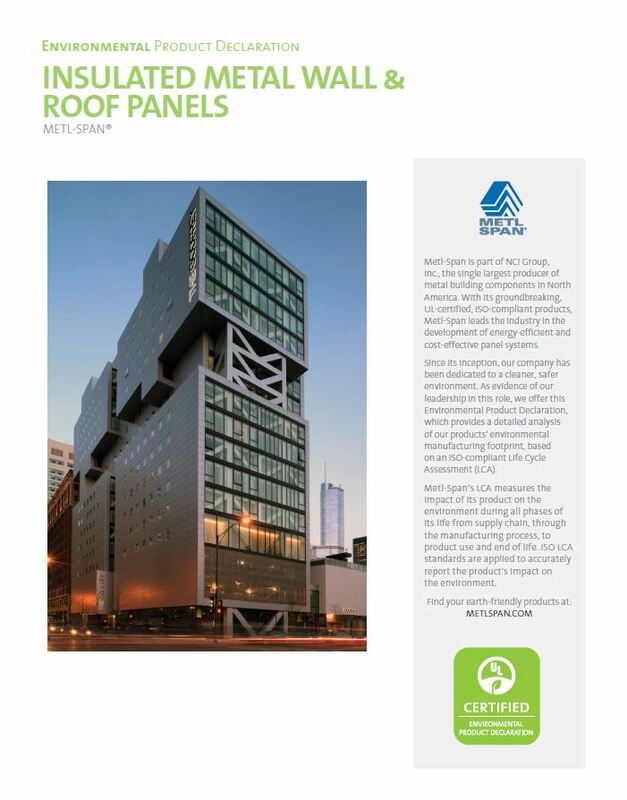 Founded in 1968, Metl-Span is a pioneer of Insulated Metal Panels (IMPs) providing state-of-the-art insulated metal panels and building materials to the commercial, industrial and cold storage industries. Metl-Span, an NCI Building Systems (NYSE: NCS) company, delivers high-quality, durable and energy-efficient solutions designed for unparalleled performance to stand the test of time with thermal and fire-rated envelope solutions for pre-engineered and conventional building markets. Metl-Span is headquartered in Dallas, Texas, with several manufacturing plants across the United States and Canada. For more information, please call 877.585.9969 or visit metlspan.com. The Metl-Span CF Architectural Horizontal insulated metal panel is ideal forhigh-profile architectural applications with its flat, monolithic look and horizontalapplications. Architectural wall panels provide a beautiful, flush appearance, allowingarchitects to accomplish a clean sight line and smooth aesthetic. The Metl-Span CF Architectural insulated metal panel is ideal for high-profile architectural applications with its flat, monolithic appearance. The panels are designed to be installed vertically with concealed clips and fasteners in the side joint. Architectural wall panels provide a beautiful, flush appearance, allowing architects flexibility with design. Metl-Span Striated wall panel is an attractive and economical alternative to typical flat wall panels. The exterior face is lightly profiled with narrow longitudinal striations to 1/32-inch depth and exhibits a virtual flat appearance from a short distance away. The ribbed profile of the Metl-Span Flute wall panel provides bold vertical lines complimentary to almost any commercial or industrial building. Inverted ribs in the profile enhance the high-tech industrial look.. The Metl-Span CF Mesa wall panel is well suited for exterior wall and interior partition wall applications. The lightly corrugated profile on both faces of the panel ensures symmetry from outside the building to inside and from room to room in partition applications. The Metl-Span CF Light Mesa wall panel is well suited for exterior wall and interior partition wall applications. The lightly corrugated profile on both faces of the panel ensures symmetry from outside the building to inside and from room to room in partition applications. The Metl-Span 7.2 Insul-Rib™ insulated metal wall panel combines a traditional 7.2 rib panel design with a premier polyurethane foam core. With a bold, ribbed pattern, this panel creates a unique architectural or industrial image. The 7.2 Insul-Rib panel can be installed either vertically or horizontally, allowing for flexibility with design. For the first time, this widely used profile is now available with exceptional insulating properties in various thicknesses. The Metl-Span Santa Fe® insulated metal wall panel has a flat exterior profile with a heavy embossed, stucco texture that mimics the look of a masonry stucco finish. Metl-Span Tuff-Cast™ is an exceptionally attractive insulated wall panel that provides an appearance of finished precast concrete. The exterior textured surface of the panel is a hard aggregated fiber reinforced polymer coating created with the factory applied Tuff-Cote® finish system. Tuff-Cote® finish offers an extremely durable, impact and abrasion resistant coating that withstands severe weather conditions. Metl-Span Tuff Wall® is an exceptionally attractive stucco-like insulated wall panel that provides the masonry look that many designers and communities desire. The exterior stucco-like surface of the panel is a hard aggregated fiber reinforced polymer coating created with the factory applied Tuff-Cote® finish system. Tuff-Cote® finish offers an extremely durable, impact and abrasion resistant coating that withstands severe weather conditions. Metl-Span CFR is an insulated metal standing seam roof panel and is the newest innovation in all-in-one composite roof panel design, combining durable interior and exterior faces with Metl-Span's unmatched Blister-Free polyurethane core. The HPCI Barrier™ metal wall panel is an air, water, thermal and vapor barrier panel that can be used behind any type of faCade. The HPCI barrier back-up panel is installed in a horizontal orientation completely outside the structural supports. There are no thermal bridges to reduce the energy efficiency of the wall. HPCI Barrier is quick and easy to install and provides an economical solution to conventional air, water, thermal and vapor control without sacrificing thermal efficiency. The Metl-Span CF partition wall panel is well suited for exterior wall and interior partition wall applications. The lightly corrugated profile on both faces of the panel ensures symmetry from outside the building to inside and from room to room in partition applications. The versatility of Metl-Span's LS-36 insulated metal roof and wall panel offers a multitude of design options. The overlapping, through fastened joint allows for quick installation in roof or wall applications that results in reduced labor costs and earlier business starts. Owners will also appreciate the energy cost savings that an insulated metal panel provides. Metl-Span's ThermalSafe® mineral wool panel is the latest development in fire resistant wall construction technology. ThermalSafe® combines advanced panel design with Metl-Span's sophisticated manufacturing expertise to create a composite panel with a core made from non-combustible structural mineral wool boards that are processed in the factory to maximize compressive strength. The resulting fire rated panel has superior structural characteristics and span capability. Metl-Span has created this mineral wool panel to achieve a one-, two- or three-hour fire resistance rating under the most demanding conditions. In addition to its fire resistance characteristics, the panel provides good thermal performance and protection from the elements. The unique LockGuard® interlocking side joint further enhances the fire resistant performance of the panel with its tongue and groove engagement of the mineral wool core. Metl-Span CFR is an insulated metal roof standing seam roof panel and is the newest innovation in all-in-one composite roof panel design, combining durable interior and exterior faces with Metl-Span''s unmatched polyurethane core. The CFR insulated metal roof standing seam roof panel is a truly unique answer to many deficiencies common with more traditional roofing materials of the past. Metl-Span CFR Roof panel is an insulated metal standing seam roof panel and is the newest innovation in all-in-one composite roof panel design, combining durable interior and exterior faces with Metl-Span's unmatched polyurethane core. The CFR insulated metal standing seam roof panel is a truly unique answer to many deficiencies common with more traditional roofing materials of the past. Metl-Span's LEED® Support material is being provided to help architects, specifiers, and design professionals in analyzing the sustainability benefits, attributes and performance criteria of insulated metal panels relative to qualifying for credits within the U.S. Green Building Council's leadership in Energy and Environmental Design (LEED®) Green Building Rating System. Metl-Span insulated panels are installed as a system over a new or existing structural steel support, such as wall or roof framing. Correct installation requires the use of butyl sealant and specifically designed fasteners, which are delivered with the panels. Metl-Span has developed the Metl-Vision® window system to further complement the exceptional architectural aesthetics and function of Metl-Span's horizontal wall panels. Metl-Vision is the first window system with a flush frame designed to fully integrate with the Metl-Span 2" and 3" horizontal wall panel to ensure a weathertight installation. The system offers great flexibility in window size, multiple lite configurations and window finish options. The finished assembly eliminates interface problems common with standard windows mated to Metl-Span wall panels that are horizontally applied.